Much of the time, praise, encouragement and clear expectations are sufficient to keep a student under instructional control so that you can teach effectively without distractions and disruptions. Sometimes, praise and encouragement is insufficient to achieve the level of compliance that you need for effective learning. At that point activity reinforcers such as games or other favored activities are added to the mix so that the student works diligently in order to participate in the activity. Some students are not motivated by activity reinforcers and need rewards that are much more closely and immediately tied to their good effort. At this juncture, you may need to consider implementing a points system. Some students cannot mediate rewards that are not almost instantaneous, especially when there is little or no perceived payoff in the task itself. A student learning to read is not going to do so in a short period of time. What they will learn in a few lessons is not sufficient in most cases to make them want to continue working diligently. They need bridges to connect all of this effort until they have progressed sufficiently so that reading itself becomes enjoyable, valuable and intrinsically rewarding. Those bridges are reinforcements. They may be from drawn any level of the hierarchy of rewards, praise, activities, points or contracts. I usually recommend increasing the level and structure of rewards as conservatively as possible. If you can keep the student on task with praise and encouragement, do not go to the next level of activity reinforcers. If praise and activities are reinforcers are not providing the degree of attention and control necessary for good learning, you may decide to introduce a points system. We often use the “Star Chart” with more distractable students. Each row of the star chart has 10 stars. Each star has five pointed tips. We have the student earn the right to color in one of the tips of the star by earning points. Typically each star tip is worth 5 points. They earn the points by paying attention, following instructions and working consistently. On the left hand side of the star chart is a list of the tasks the student will engage in. The tasks could be saying sounds and sound combinations, blending sounds into words, reading words, reading stories etc. Our Maloney Method reading system has 14 distinct tasks which the child will do in order to learn to read. On the right hand margin of the star chart are a list of points which are required for the student to “purchase” a reward. 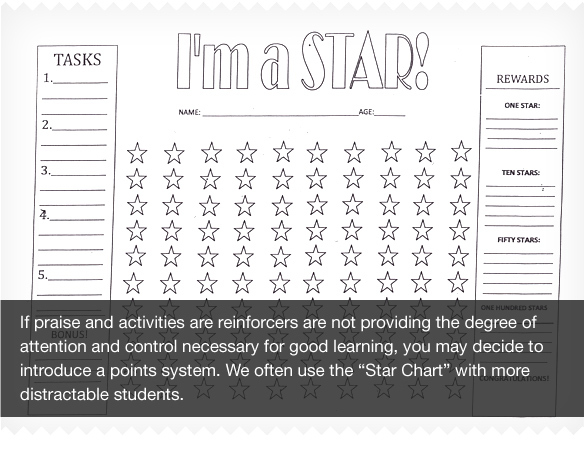 The rewards and their costs are negotiated with the student when the star chart is introduced. At various times during the lesson, the teacher will award points to the student. Point counts can be easily kept on a golf counter so that the lesson is not continually interrupted. When the student is provided a break in the lesson, the points can be counted and the star tips colored in. We typically draw a line after the last star the student has to earn for their reward. That way the student can always see how much further s/he has to go to earn a reward. Every child has a list as long as your leg of things that they want. I simply ask them to help make up the list. Then we negotiate the cost of the items on the list. Typically I suggest a penny per point as a payoff. I always try to create a list with some inexpensive items that they can earn quickly, typically within a day or two. I will also be more generous in awarding points in the early going to make sure that the “hook” is set. Once they have earned a few treats, I may become a little more demanding. I will also award double points for obvious gains, such as reaching the standard on a fluency check where the correctly identify 50 sounds or sound combinations in one minute. I also will put the star chart in a conspicuous place such as the door of the refrigerator or the front of their locker or on their desktop so that they are constantly reminded of the rewards and how to earn them.